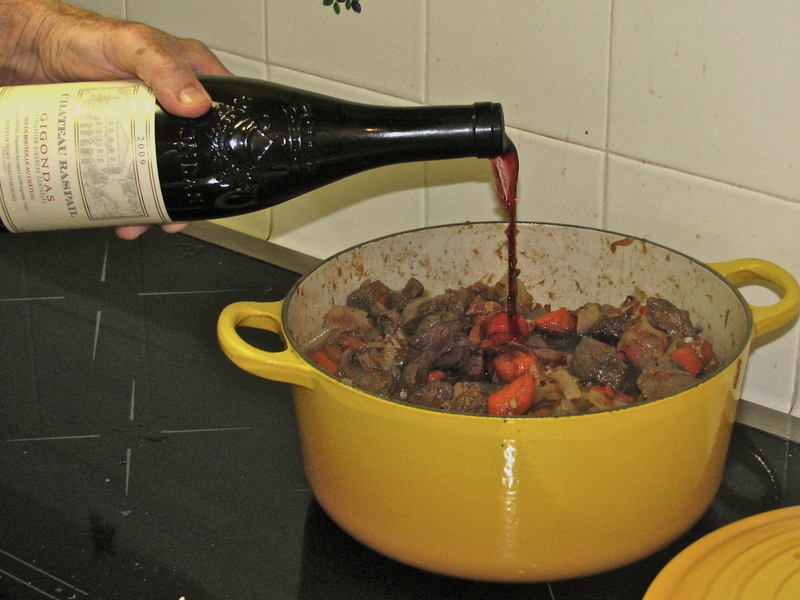 Beef Bourguignon was first made in the Dark Ages – about 400 AD when wine culture in the burgundy region of France was established. In the 1700’s, it was discovered by the French elite and it has remained high on the list of “haute-cuisine” ever since. Let’s thank Julia Child for introducing this wonderful dish to the U.S. in her 1961 classic “Mastering the Art of French Cooking”. Check out Julia on YouTube showing us how to prepare the dish. The Bravado recipe is simpler to prepare than Julia’s and is closer to the technique of Ina Garten, the great Barefoot Contessa. Our recipe is, in our humble opinion, better because we have more carrots and onions and we cook our dish ALL DAY LONG. This is a great family and friends bonding dish. Work starts in the morning with prep, browning and, most importantly, the “cognac flambé”. Just before you put the dish in the oven to slowly cook, you add ½ cup of cognac, which you ignite amid shouts of joy and perhaps an early toast of Champagne. Once the dish is in the oven, you can play golf, go to the movies or whatever. The longer it cooks the better. Some like to serve this dish with noodles or rice or mashed potatoes. These all work, but our recipe uses Ina Garten’s suggestion of using 4-6 inch pieces of fresh baguette, broken open, and gently toasted. The bread quickly absorbs all the wonderful juices, better than noodles, rice or potatoes ever will. “Nearly 50 percent of the fat in coconut oil is of a type rarely found in nature called lauric acid, a “miracle” compound because of its unique health promoting properties. Your body converts lauric acid into monolaurin, which has anti-viral, anti-bacterial and anti-protozoa properties. Rather than try to prepare a vegetable to match this great classic, make sure you have started the food event with a good appetizer like Coquilles St. Jacques, serve the Beef Bourguignon by itself and offer a great dessert afterwards. How about a Tarte Tatin?!! In a large Dutch oven (the Le Crueset 5-1/2 qt. is ideal) cook the bacon until crisp and brown. Set aside using a slotted spoon. Dry the meat with paper towel, add salt and pepper. Add 2 tbsp. of coconut oil to the Dutch oven and brown the meat about 2 minutes on each side at medium high heat. Brown in stages making sure you are only covering the bottom of the pan with pieces of meat. Drain and set aside using a slotted spoon. Lower the heat to medium, add one more tbsp. of coconut oil and all of the onions and carrots. Stir well and cook covered for 10 minutes, stirring occasionally. Add the garlic, bay leaf and thyme and cook for two minutes. Add the Cognac and light. Stir and allow to burn off. Return the meat and bacon to the Dutch oven and add the bottle of wine along with enough beef broth to fully cover the ingredients. Bring to a simmer and then cover and transfer to the oven. Cook for 3-4 hours until the meat comes apart easily with a fork. When the meat is finished, sauté the mushrooms in 2 tbsp. of butter for about 10 minutes. Make a roux with 4 tbsp. butter and ¼ cup of flour in a small saucepan. 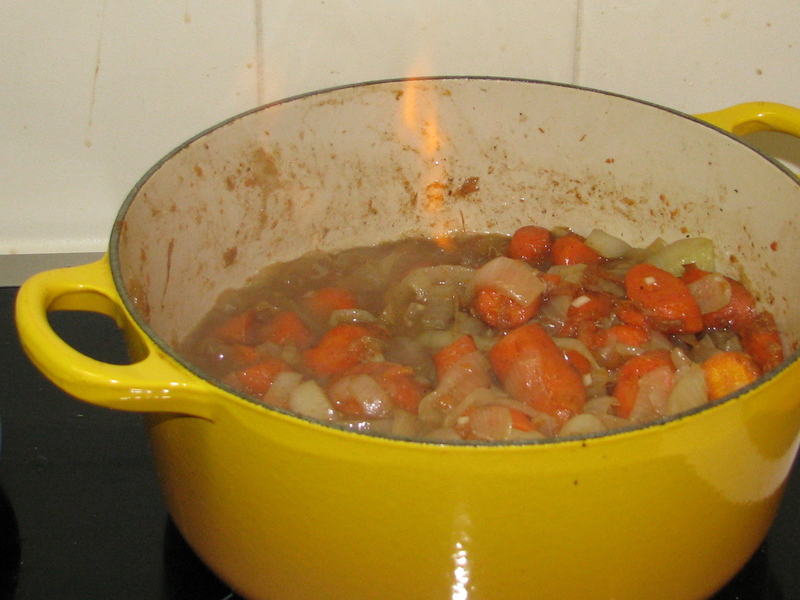 Transfer to Dutch oven to the cooktop and turn heat to simmer. Add the sautéed mushrooms, frozen pearl onions, flour/butter roué, and tomato paste. Simmer for 15 minutes. While simmering, cut the baguettes into four or five pieces, slice open, place on a baking sheet and toast lightly under the broiler for about one minute. 13. Take the Dutch oven and the baguettes to the table and serve family style. 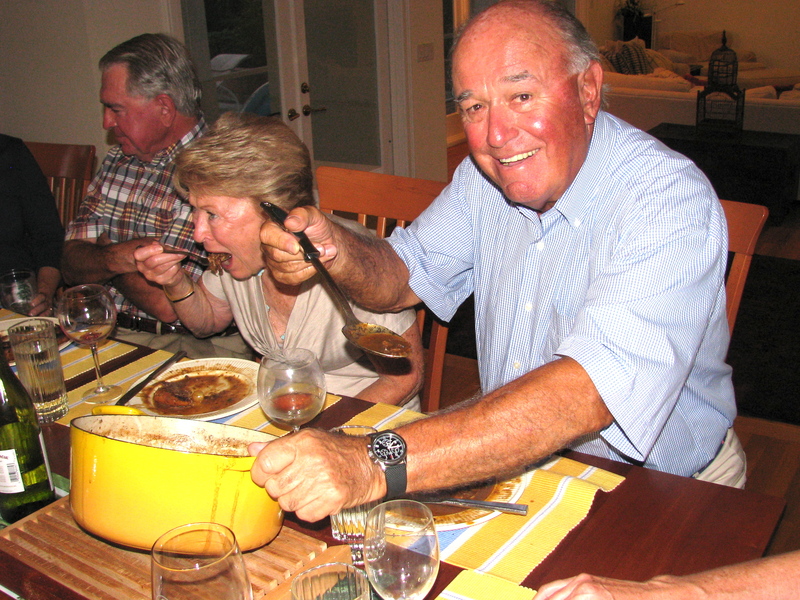 You will have none of this dish left – people will be grabbing for the last morsels. On of my favorite comfort foods. Do you add the coconut oil to the bacon fat before browning the meat, or are you saying we should brown the meat separately? Also, while you may be a roué, it is a roux that you are making with the butter and flour. I like to add a the coconut oil to the bacon fat. If I only use the bacon fat, I never seem to have enough. However, you can easily eliminate the coconut oil if you wish. It is “roux” – sorry and thanks for the catch.